Taking to his Twitter, the 'Mulk' star uploaded a picture in which he can be seen standing beside Javed and wife Neetu. He wrote, "Thank you Javed Sahab for entertaining and making us laugh so much. Thank for visiting us! Wish you all super luck for your blockbuster musical shows. Believe me-your show is a breakthrough idea." 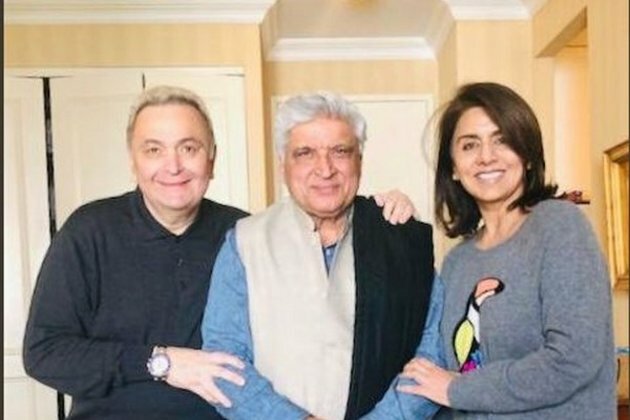 Recently, The 'Kapoor and Sons' star had also met his 'old friend', actor Anupam Kher, and his 'Agneepath' co-star Priyanka Chopra along with Sonali Bendre and her husband Goldie Behl. In a cryptic tweet last month, Rishi announced that he was travelling to the US for medical treatment. Before his well-wishers could jump to conclusions, the 'Mulk' actor asked them not to speculate his leave of absence.